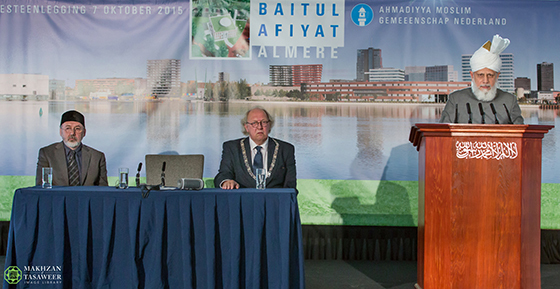 Hazrat Mirza Masroor Ahmad lays foundation stone for Baitul Aafiyat Mosque in Almere. 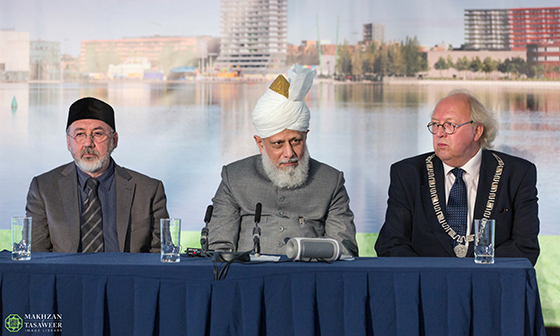 The Ahmadiyya Muslim Community is pleased to announce that on 7 October 2015, His Holiness, Hazrat Mirza Masroor Ahmad, the World Head of the Ahmadiyya Muslim Community, the Fifth Khalifa (Caliph), laid the foundation stone for the first Ahmadiyya Muslim Mosque in the Dutch city of Almere.His Holiness has named the Mosque, Baitul Aafiyat (The House of Peace and Security). Upon completion, the new Mosque will be the Ahmadiyya Muslim Community’s second purpose built Mosque in Holland. More than 55 guests attended the ceremony, including the Deputy Lord Mayor of Almere, Mr Frits Huis.The formal session began with a welcome address given by Hibatun Noer, the National President of the Ahmadiyya Muslim Community in Holland. 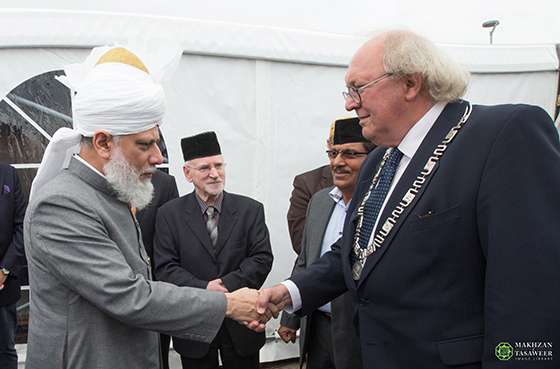 Thereafter, the Deputy Lord Mayor of Almere, Frits Huis welcomed Hazrat Mirza Masroor Ahmad to the city. Deputy Lord Mayor of Almere, Frits Huis said:“Both His Holiness and I were born in the same year but His Holiness has far more wisdom than me and hence I will keep my comments extremely brief. It is much more important for us all to listen to him. 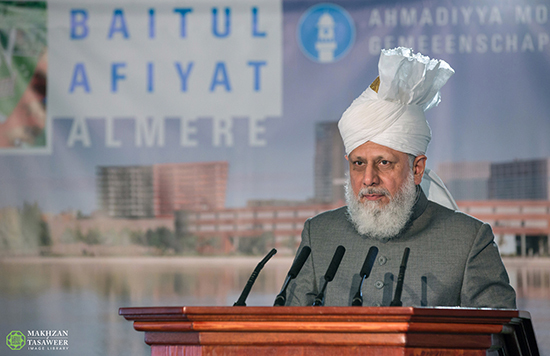 All I wish to add is that the key principle of the Ahmadiyya Muslim Community is peace and so you are extremely welcome in Almere.”The keynote address was delivered by Hazrat Mirza Masroor Ahmad who said the new Mosque would become known as a “beacon of peace” and “a means to unite mankind”. Hazrat Mirza Masroor Ahmad said that the Mosque would be a means of uniting society and bringing people together. His Holiness said that rather than being a threat to the peace of the local society, it would prove to be a source of peace and security. The religious leader said that true Mosques welcomed all peaceful people, regardless of religion or background. His Holiness concluded by thanking the local authorities and people for supporting the Ahmadiyya Muslim Community’s efforts to build a Mosque in Almere. 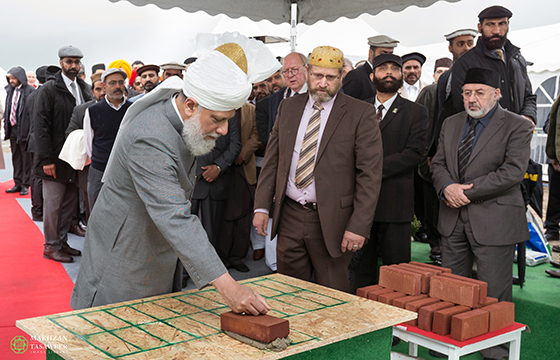 Following his address, Hazrat Mirza Masroor Ahmad laid the foundation stone for the Baitul Aafiyat Mosque. The respected wife of His Holiness, Hazrat Amtul Sabooh Begum also laid a stone and thereafter a number of Central, National and Local Ahmadi Muslim officials also laid stones.